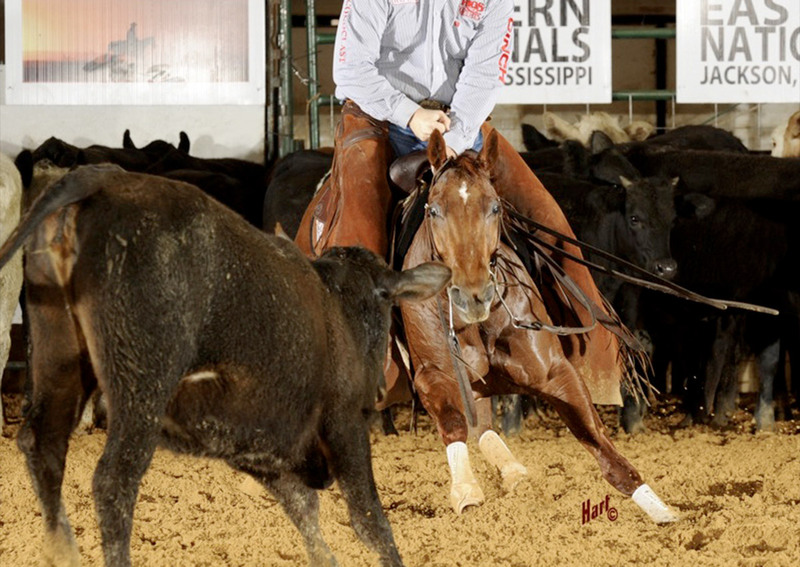 During the first week of competition at The Four Sixes/NCHA Eastern Nationals, held March 9-21 at the Mississippi Fairgrounds in Jackson, Mississippi, competitor’s endured wet weather and tough competition, but eight champions were crowned. On March 11, the first champion was crowned in Jackson. Leading the pack and taking home the $15,000 Novice Championship was Austin Shepard and Cat Sheree (High Brow CD x Nurse Sheree x Peptoboonsmal). However, the 2010 mare, bred by Bill Paxton of Tallulah, Louisiana, owned by Plantation Farms LLC, of Denham Springs, Louisiana, wasn’t finished yet. During the Open finals on March 12, 23 horse-and-rider teams were trying to earn the paycheck and the Championship, but after Shepard and Cat Sheree entered the pen as the first draw, no one could touch them. The duo marked a whopping 223, taking home the Open Championship. Shepard, of Summerdale, Alabama, also piloted Sweet Little Cats (High Brow Cat x Sweet Little CD x CD Olena) to the $15,000 Novice Reserve Championship with a score of 217. The 6-year-old gelding was bred by Bob Wendel and James Eakin, of Hondo, Texas, and is owned by 10/27 Ranch LLC, of Denham Springs, Louisiana.